As I review and highlight business and consumer optimism, I feel as though my thoughts are a bit like a broken record that plays the same song over and over again. With that, another business optimism survey is highly positive. 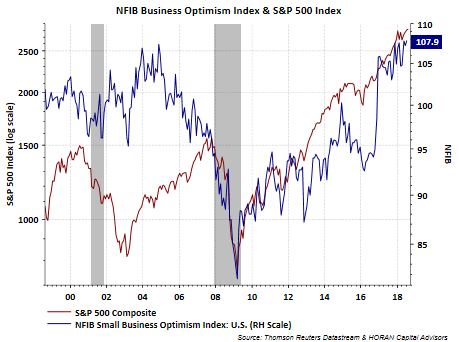 The National Federation of Independent Business (NFIB) reported that small business optimism rose to the second highest level in the indexes history. The optimism index level of 107.9 was only .1 points lower than the record high reading reached in July 1983. "The July 2018 report also set new records in terms of owners reporting job creation plans and those with job openings. A seasonally-adjusted net 23 percent are planning to create new jobs, up three points from June. Thirty-seven percent of all owners reported job openings they could not fill in the current period, a one-point increase from June (emphasis added.)" Another category contributing to business optimism is the fact top line revenue growth remains robust. The report shows that "July is the eighth consecutive strong month of reported sales gains after years of low or negative numbers. A net 35% of owners expect better business conditions, ticking up two points from June." All in all this is another strong confidence report. Historically, recessionary periods do not occur until several years subsequent to peaks in the NFIB index and other economic data suggests further economic growth ahead.